Queen Elizabeth has arrived at the Blohm + Voss Shipyard at Hamburg for her first scheduled dry dock since she entered service in 2010. Following the multi-million-dollar refit, Queen Elizabeth will leave the yard on June 1 and return to service on June 4 with a short cruise from Southampton to Amsterdam. Norwegian Jewel is returning to service Saturday after its regular dry dock, refurbished and ready for its Alaskan season. Of course, after Alaska, Norwegian Jewel will be ready for Norwegian’s return to the Houston market this fall. During the two-week dry dock, numerous enhancements and changes were made. CND subscribers also read about a top level meeting ... a big day in Vancouver ... and a even bigger day in Barcelona. Happy Birthday Queen Mary 2! 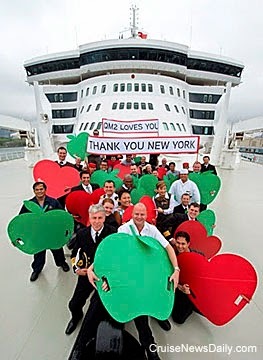 Cunard's flagship celebrates her 10th anniversary in The Big Apple, New York, New York, USA. Master of Queen Mary 2, Captain Kevin Oprey together with members of his crew celebrate the ship’s 10th anniversary in New York City today. Cunard is today recongnising the long standing and enduring relationship with New York having sailed here since 1845. Cunard continued its celebration 10th anniversary of its flagship, Queen Mary 2 with her arrival in New York on May 16th from Southampton during the first of a pair of commemorative Transatlantic Crossings. Her arrival in the Big Apple pays homage to her maiden Transatlantic Crossing 10 years ago. The ship arrived at first light to begin a day of joyous celebration in the city. A special afternoon reception on board was hosted to toast Cunard Line’s and Queen Mary 2’s long-standing relationship with New York over the past decade. Photo courtesy of James Morgan/Cunard. All rights reserved. Citing ongoing uncertain conditions in the Ukraine, Silversea has modified the rest of this year’s Black Sea cruises that were scheduled to call at Yalta, Sevastopol or Odessa. Regal Princess was officially handed over to Carnival Corp/Princess Cruises today in Monfalcone and Princess wasted no time in sailing it out of the yard to nearby Trieste where it arrived just before 4pm. Princess is planning a relatively low-key celebration and preview cruise Friday, and they will mark the event of the inaugural cruise on May 20, but as we said earlier, they are saving the high-profile events for the fall when the ship arrives in the US and is christened. Today’s departure was actually made possible by an Italian court ruling last week. We have video of Regal Princess' arrival at Trieste here on our blog. * Other Things You’ll Want to KnowCND subscribers also read about Alaska getting "board" ... taking shape (more) ... `and perfect Ecstasy. (Ft. Lauderdale, FL -- May 15, 2014) Taking into account the unsettled situation in Ukraine, Silversea Cruises has modified the itineraries for four Black Sea voyages originally scheduled to call in Yalta, Sevastopol, or Odessa this year. Silver Spirit's July 21 seven-day sailing will remain entirely a Black Sea itinerary with Trabzon replacing Odessa, while three new nine-day voyages will focus on destinations in Greece and Turkey, and also retain the original Black Sea ports of Constanza and Nessebur. The new nine-day voyages, Silver Cloud's October 13 sailing and Silver Spirit's voyages of August 20 and September 29, have been enhanced with an added perk. Departing from Constanza, guests may enjoy a complimentary full-day Silversea Experience in Bucharest, renowned as the "Paris of the East" for its tree-lined avenues, elegant architecture, and vibrant atmosphere. Highlights include a scenic drive through Romania's countryside, a delicious Romanian-style lunch, and an enriching exploration of the capital city's Palace of Parliament, Patriarchal Hill, open-air Village Museum, and Revolution Square. Alternatively, guests may opt for a $200 per guest onboard credit. VOYAGE 5422: Silver Spirit, July 21 - 28, Istanbul to Istanbul, with calls in Sochi, Trabzon, Sinop, Constanza, and Nessebur. Silver Privilege fares start at $3,550. VOYAGE 5426: Silver Spirit, August 20 - 29, Istanbul to Istanbul, with calls in Kavala, Thessaloniki, Volos (gateway to the famous rock towers and monasteries of Meteora), Athens (Piraeus), Izmir, Constanza, and Nessebur, plus passage through the historic Dardanelles and Bosphorus. Added perk: choice of complimentary Silversea Experience in Bucharest or $200 per guest onboard credit. Silver Privilege fares start at $5,550. VOYAGE 5431: Silver Spirit, September 29 - October 8, Istanbul to Istanbul, with calls in Myrina (Limnos), Thessaloniki, Skiathos, Athens (Piraeus), Izmir, Constanza, and Nessebur, plus passage through the historic Dardanelles and Bosphorus. Added perk: choice of complimentary Silversea Experience in Bucharest or $200 per guest onboard credit. Silver Privilege fares start at $5,450. VOYAGE 1431: Silver Cloud, October 13 - 22, Istanbul to Istanbul, with calls in Kavala, Thessaloniki, Volos (gateway to the famous rock towers and monasteries of Meteora), Athens (Piraeus), Izmir, Constanza, and Nessebur, plus passage through the historic Dardanelles and Bosphorus. Added perk: choice of complimentary Silversea Experience in Bucharest or $200 per guest onboard credit. Silver Privilege fares start at $4,650. "The safety and well-being of our guests is always our top priority. These new itineraries eliminate the uncertainty surrounding Ukraine, while providing our guests with peace of mind and attractive destinations for their ultra-luxury cruise vacation," said Kristian Anderson, Silversea's senior vice president and general manager for the Americas. For more information and complete voyage details, please visit Silversea.com. Regal Princess arrived at Trieste this afternoon just before 4pm from the Fincantieri yard in nearby Monfalcone. Like its sister, Royal Princess, the ship's whistles can play the Love Boat theme, which is demonstrated here on its maiden arrival for Princess. Regal Princess will enter regular service with a cruise from Venice on May 20. Fort Lauderdale, FL (May 15, 2014) – Just 45 days after launching its sweeping “Serving You” travel agent enhancements at CLIA’s Cruise3Sixty, MSC Cruises today announced that it has completed hiring to double its North American sales force. The announcement includes the promotion of Wayne Peyreau to regional vice president, Sales USA, and the appointment of Denise Reichwein as the new regional sales director for the North Eastern region of the U.S. Since he joined MSC Cruises in 2011, Peyreau has been instrumental in shaping the U.S. sales organization with responsibility for Field Sales, National Accounts, Inside Sales and Sales Service. He has helped restructure the sales organization to better support the line’s travel agent partners by implementing and overseeing training, Sales CRM management, developing new reporting tools and building preferred relationships with National Accounts, among others. As Regional Vice President, Sales USA, Peyreau will be responsible for USA South Field Sales managers throughout Florida, Georgia, Alabama, South Carolina, North Carolina and Virginia as well as the Business Development Specialists and Sales Support Specialists in the Ft. Lauderdale headquarters. Reichwein brings more than a quarter century of industry experience to MSC Cruises as the newly appointed regional sales director for the North Eastern region of the U.S. She will be responsible for managing the USA North Field Sales Managers covering New York, New Jersey, Pennsylvania, Illinois, Wisconsin, Indiana, Ohio, Michigan, Massachusetts, Rhode Island, Maryland, Connecticut, Delaware, and Washington, DC. Prior to MSC, she spent seven years at Royal Caribbean International as a Business Development Manager in Eastern Pennsylvania, focusing on new business and building strong relationships with travel agent partners. She also brings a point-of-view from the other side of the desk with more than 20 years of travel agency experience. She has earned her Master Cruise Counselor, is a lifetime member of CLIA Education Programs and currently enrolled in the Elite Cruise Counselor Program. These key leadership positions held by Peyreau, Reichwein and Patterson, along with the addition of the new Business Development Managers, Business Development Specialists, Sales Support Specialists and Sales Service team, provide a full complement of seasoned sales professionals to assist and support the travel agent community. Travel agent partners around the U.S. and Canada will have the opportunity to meet their dedicated MSC Cruises sales contacts at a series of Serving You Roadshow events scheduled to kick-off on May 29 in Atlanta and continue throughout 2014 in more than 20 major markets and regions. For more information about MSC Cruises, please visit www.msccruisesusa.com. Onboard MSC’s twelve vessels, guests enjoy the Mediterranean way of life. From the hospitality to the dining, guests are enveloped in the Mediterranean manner of enjoying life to its fullest. Guests are encouraged to slow down and enjoy everything their MSC vacation has to offer. Kids 11 and under sail free year-round on MSC Cruises with kids 17 and under sailing at reduced rates. MSC Cruises is a privately-held, family-owned, Italian cruise line with a fleet of 12 ships: MSC Armonia, MSC Divina, MSC Fantasia, MSC Lirica, MSC Magnifica, MSC Musica, MSC Orchestra, MSC Opera, MSC Poesia, MSC Preziosa, MSC Sinfonia and MSC Splendida. The fleet cruises year-round in the Mediterranean and seasonally in the Caribbean, Northern Europe, the Atlantic Ocean, the French Antilles, South America, South and West Africa, The United Arab Emirates and the Red Sea. MSC Divina began sailing the Caribbean from PortMiami on November 20, 2013, becoming the line’s first ship dedicated to North American travelers. In March 2014, the line announced the construction of two new cruise ships by STX France due for delivery respectively in 2017 and 2019. For more information, visit www.msccruisesusa.com. 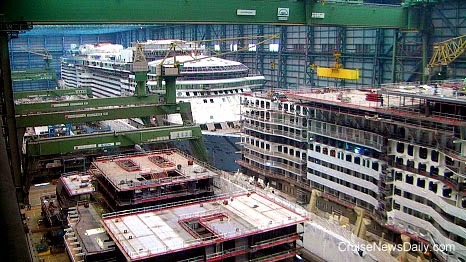 Royal Caribbean's Quantum of the Seas (left) is shown in the latest construction update this week from Meyer Werft. Anthem of the Seas is shown on the right. The ships are being constructed inside Meyer Werft's giant covered building dock 6 at Papenburg, Germany. Cruise lines do become creatures of habit. They repeat the same itineraries. Why? Because they are popular. They may tweak them, but often they are similar year after year. MSC has come up with something quite a bit different out of Southampton this summer. Something different from the Mediterranean. Something different from northern Europe. CND subscribers also read about an old friend coming back into your life ... and what to do with that drone you got for your birthday. Allure of the Seas taken from a drone at St. Thomas. Last week Celebrity Equinox became the third RCCL ship to join a program of the University of Miami's Rosenstiel School of Marine and Atmospheric Science. While the ship was in dry dock, equipment was installed to capture and analyze oceanographic and atmospheric data as it sails and transmit it back to scientists in Miami. It joins the project along with Allure of the Seas and Explorer of the Seas, which pioneered the forerunner to the program back in 2000 when Explorer was launched. CND subscribers also read about going where Mr Sulu hasn’t gone before ... Manhattan, cake and leggy dancers - could a birthday get any better? ... and news from France. As we reported last week, Friday was a big day at the STX France yard in Saint-Nazaire (France) in more ways than one. The scheduled event was the keel laying for Royal Caribbean's third Oasis-class ship, but Royal Caribbean used the occasion to announce that they were expanding the order to include a fourth ship. This video shows some of the highlights of the day and includes comments from various Royal Caribbean and STX executives. one year of sailing from Manhattan. 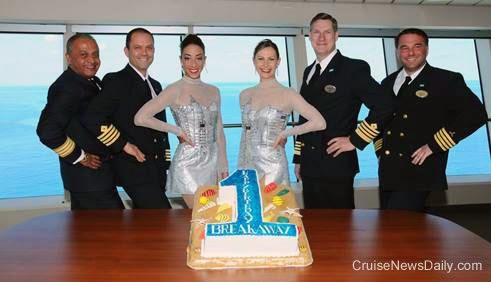 NEW YORK – May 13, 2014 – Norwegian Breakaway, the ship that brings the best of NYC to sea, celebrates one year of sailing from New York City this week. Since arriving in New York in May 2013, the ship has carried nearly a quarter of a million guests from New York to sunny destinations in Bermuda, the Bahamas, Florida and the Caribbean. Her anniversary signals the start of the summer season, as the ship is sailing the second of 22 weekly cruises to Bermuda through September 28. Norwegian Breakaway offers seven-day voyages from the heart of Manhattan each Sunday, with three days in port at King’s Wharf, Bermuda. Guests sailing to Bermuda this season have yet another amenity to look forward to onboard, as the casino will now be able to open while the ship is in port, opening at 9 pm each evening while the ship is docked at King’s Wharf. Norwegian Breakaway’s birthday week sailing also coincides an exciting milestone for the ship: Cirque Dreams & Dinner: Jungle Fantasy, held in the ship’s Spiegel Tent, will host its 2,000th performance onboard. Over the past year, Norwegian Breakaway has had a positive economic impact on the city, contributing to the $229 million generated across the industry and a 16% increase in guest and crew spending in the city. Norwegian Breakaway features 29 dining options, including restaurants from Food Network Star and Iron Chef Geoffrey Zakarian and Master Baker Buddy Valastro, star of TLC’s “Cake Boss”; three Broadway shows; an ice bar; a weekly fireworks show at sea; and the largest Aqua Park and ropes course at sea, including five water slides. Her signature hull art, designed by legendary artist Peter Max, brings the energy of the Big Apple to the ship wherever she sails. For more information on the incredible features and accommodations on Norwegian Breakaway, visit www.breakaway.ncl.com. Designed as New York’s ship, Norwegian Breakaway brings the best of NYC to sea from her year-round homeport in Manhattan, offering the high-caliber dining and entertainment options that New York is known for worldwide. The ship’s groundbreaking design includes an open-air boardwalk, The Waterfront, and 678 Ocean Place; a wide range of indoor and outdoor venues on three dynamic decks that will create a whole new complex at sea that enhances guests’ connection with the ocean. Norwegian Breakaway’s entertainment includes three Broadway shows: five-time Tony nominated ROCK OF AGES; the dance sensation BURN THE FLOOR; and CIRQUE DREAMS & DINNER JUNGLE FANTASY. The famed comedy troupe The Second City, Howl at the Moon dueling pianos, and New York’s own Slam Allen also perform on the vessel. Norwegian Breakaway features an exciting fireworks show on every cruise that will dazzle guests on the second to last night at sea each week, and is the grand finale of a decadent 1980s-themed deck party. Celebrity Chef and Food Network star Geoffrey Zakarian has also debuted his first restaurant at sea on Norwegian Breakaway: Ocean Blue by Geoffrey Zakarian, along with two additional venues, The Raw Bar and Ocean Blue on the Waterfront. Buddy Valastro, star of the TLC series “Cake Boss,” opened an extension of his popular bakery, Carlo’s Bake Shop, onboard. The ship features a total of 29 dining options on board and an Ice Bar, which is kept at 17 degrees Fahrenheit and features New York City-inspired specialty cocktails, as well as ice sculptures of the Brooklyn Bridge and Statue of Liberty to pay homage to New York City. The top decks of Norwegian Breakaway feature the first Aqua Park at sea with five full-size water slides, including twin Free Fall slides, the first ever at sea, and a three-story sports complex that includes the largest ropes course at sea, a nine-hole miniature golf course, basketball court, rock climbing wall and more. The ship also offers a rich mix of stateroom options including The Haven™ by Norwegian, comprised of 42 Suites at the top of the ship and 22 additional Suites located throughout the ship; the innovative Studios, designed and priced for solo travelers; Oceanview staterooms, Balcony and Mini-Suites; along with Spa Balcony, Mini-Suites and Suites in close proximity to the spa. 13 May 2014 – Cunard Line is delighted to announce that actor and social media superstar George Takei will join Queen Mary 2 on her 28 July Transatlantic Crossing from New York to Southampton. Guests and fans on board the eight-day voyage will be treated to two presentations in the Royal Court Theatre, followed by a Q&A session with the multi-talented star and dynamic personality. With a career spanning five decades, Takei is most well known internationally for his founding role in the original Star Trek television and film series, in which he played Hikaru Sulu, helmsman of the starship Enterprise. These days, he bridges multiple generations of fans as one of the most influential personalities on Facebook with more than 6.9 million “Likes” to date. Takei and Tony Award winner Lea Salonga star in the Broadway-bound stage play, Allegiance – A New American Musical, based on the experiences of Takei and his family who, like more than 120,000 Japanese-Americans, were held in internment camps during World War II. “George Takei: Embracing Change” will focus on the many communities that have been central to his life and career: the Japanese-American internment camp of his childhood, the cast and creators of Star Trek, and the Asian-American and LGBT communities for which he has become a leader in the United States. “George Takei in Hollywood” will be a trip down memory lane with the actor on his 50-plus years in show business, from his first feature film, 1960’s Ice Palace starring Richard Burton, to his many Star Trek memories, to his upcoming Broadway debut in Allegiance. George Takei is part of Cunard’s illustrious history of hosting famed entertainers with peerless cachet. Legendary notables such as Elizabeth Taylor, Rita Hayworth, Cary Grant and Clark Gable frequently crossed the Atlantic on Cunard’s earlier Queens, Queen Mary and Queen Elizabeth; and since Queen Mary 2’s debut nearly ten years ago, the ship has welcomed film notables such as George Lucas, Uma Thurman, John Cleese and Angela Bassett. Later this year, Grammy® Award-winning singer-songwriter James Taylor, will also join Queen Mary 2 on her 27 August Transatlantic Crossing. For nearly 175 years, Cunard Line’s Transatlantic Crossing has appealed to a broad range of sophisticated travellers with a love of glamour, elegance and tradition. Each Crossing aboard Queen Mary 2 features a series of Royal Nights themed balls on the largest dance floor at sea in the Queens Room; and the Royal Court Theatre presents West End-style musical revues and guest performers. Stateroom and Grills Suites are still available for the 28 July 2014 Transatlantic Crossing (voyage #M414A) with fares starting from $1,599 per person. Christened by Her Majesty The Queen in 2004, Cunard Line’s flagship Queen Mary 2 defines luxury travel for the 21st Century and continues an almost 175-year legacy of Transatlantic travel. Queen Mary 2 is the fastest passenger ship in the world and achieved her 200th Transatlantic Crossing in July 2013. Since becoming Cunard flagship on completion of her maiden Transatlantic Crossing in May 2004, Queen Mary 2 has remained unchallenged as the world’s largest, longest, tallest, widest and most expensive ocean liner ever built and the most famous and fastest passenger ship in operation today. To celebrate Queen Mary 2’s 10th Anniversary in 2014, special on board events are planned for her westbound Transatlantic Crossing on 9 May and her eastbound Crossing on 16 May. Famous names who have experienced this iconic voyage since 2004 include President George H.W. Bush, Desmond Tutu, James Taylor, Rod Stewart, Carly Simon, Uma Thurman, Richard Dreyfuss, John Cleese and Angela Bassett. Carnival Corp said this morning they are going to grow again in China by basing a fourth ship in China, which the company said was the world’s fastest-growing cruise market. Beginning in April 2015, the Costa brand will base the 114,500-ton Costa Serena (carrying up to 3,780 passengers) in Shanghai year round. It allows Carnival to say they are the first global cruise company with that many ships in the Chinese market. There was cause for celebration in Italy on Sunday when Fincantieri, one of the “heavy industries” of the country, delivered a major product - a cruise ship, namely Regal Princess - to its buyer, one of only a handful of times it happens each year. (This is only the 65th cruise ship the company has ever built.) But in the weird, convoluted ways of the sea and shipbuilding, it wasn’t really handed over to Princess yet. Fincantieri delivered Regal Princess to Carnival Corp Sunday at Fincantieri's Monfalcone yard. The ship, a sister to Royal Princess, will enter service on May 20 from nearby Venice. The ceremony was low key, intended mostly for local consumption, with Italian Prime Minister Matteo Renzi in attendance. Regal Princess will sail in the Mediterranean this summer. It will be officially named when it is repositioned to the US this fall for its winter Caribbean season. under construction at the next pier. Photo courtesy of Fincantieri. All rights reserved. May not be copied or used without permission.